Some things on this planet are just pure and good. 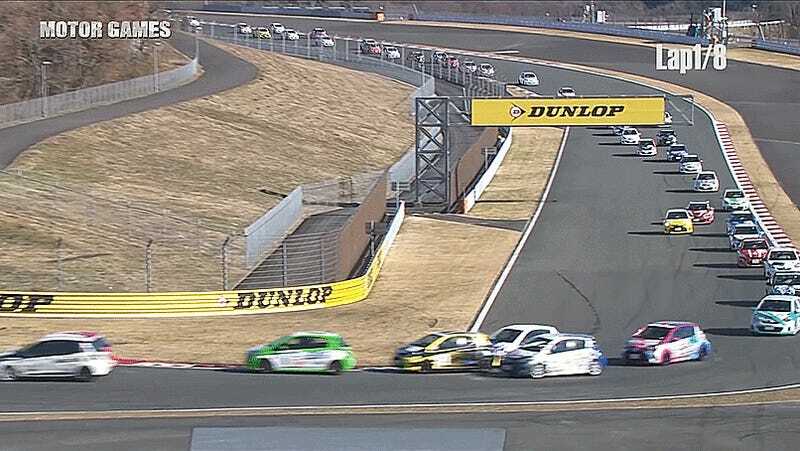 Japan’s Netz Cup Vitz Race is one of those things. Take a zillion of the little hatchbacks that we get in the United States badged as a Yaris, and go racing. Watch, and smile. Skip to the 4:19 mark for the racing. Look at all these Vitzes on Japan’s Fuji International Speedway. The field is packed! Isn’t it adorable? It’s impossible to watch the Netz Cup Vitz Race and not smile. Here is a car that’s a surprising hoot to whip around like a maniac getting pushed to its mechanical limits on a race track like it should be. The cars are evenly matched because every single one is a Vitz, so the race stays close until the very end. By lap two, the drivers are getting delightfully aggressive in what can only be described as a herd of cute little cars. The penultimate lap kicks off an incredibly intense side-by-side battle that makes you forget they’re in a car you’d usually pick up as a cheap rental over here. Big-time series like Formula One and NASCAR are nice and all, but the idea of taking the Vitz racing is all that’s right and good about motorsports in a nutshell. Do more spec series with inexpensive fun cars, everyone. This is the action that has been missing from my life.